Raheem Sterling scored a double in his side’s 3-1 win over Crystal Palace on Sunday. Raheem Sterling celebrates a goal. 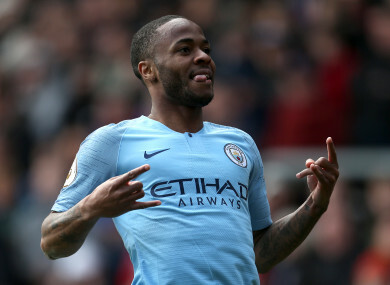 THE PREMIER LEAGUE title race will go to the wire according Manchester City’s Raheem Sterling, after he scored a double in his side’s 3-1 win over Crystal Palace on Sunday. “100% the way Liverpool have been playing,” Sterling told the BBC, when asked about the title race going to the end. When I was younger you always want to score your first opportunity and sometimes it doesn’t happen like that,” he said. Email “'100% the way Liverpool have been playing. It will go down to the wire' ”. Feedback on “'100% the way Liverpool have been playing. It will go down to the wire' ”.